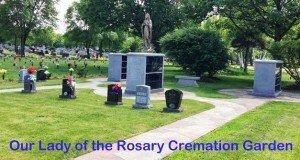 Our Outdoor Columbarium Niches are designed into in the Our Lady of the Rosary Cremation Garden. Single Granite Front Niche: A space within a columbarium designed for the entombment of cremated remains, in an exterior setting. Single granite front niches are intended to be used by one cremated remains of person behind a granite shutter so the urn will not be visible. Double Granite Front Niche: A space within acolumbarium designed for the entombment of two cremated remains in an exterior setting. Double granite front niches are intended to be used by two cremated remains of two person behind a marble shutter so the urn will not be visible. Additional fees for Saturday funerals.